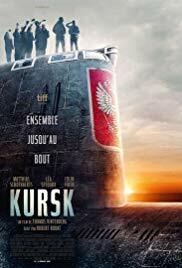 When a HP (Hydrogen Peroxide) torpedo explodes in the forward compartment of the Kursk, Russia’s premier nulcear submarine, all but 23 of the vessel’s 118 man crew are killed. The remainder survive in the aftermost compartment and await rescue. On shore the wives wait for news and are told lies by the assembled navy PR men while at the location of the wreck the only remaining Russian rescue submarine, with limited capability fails to lock onto the escape hatch. Norwegian and British assistance is dispatched but the Russians are reluctant to accept help. We know what the outcome was. Scenes with the Russian crew’s families in the the submarine’s home port, as one of them gets married, then off to sea shortly to be followed by the disasterous explosion. The survivors struggle in the aft compartment which is slowly flooding. The authorities lie to the wives who are rebellious and to the press who are disbelieving. The Russian rescue sub has problems and the British wait with frustration on the sidelines. There is a lot of tension and a bit of drinking. A View I know quite a bit about this disaster, and thought that the film presentation did pretty well, establishing the comaraderie the crew feel for each other, and similarly how the wives feel. I have been out there on an offshore vessel and think it was all pretty well done, and as for the critics who have dissed it, I would say what the f**k do they know. So, in my view worth the ticket price. Source of story Real events and a book by Robert Moore A Time to Die. Additional Info Luc Besson was executive producer. I am putting some info about the ships actually involved on my website www.shipsandoil.co.uk .